Mosquito control is an important step in stopping the spread of diseases like West Nile Virus. In the summer months, trucks canvass Roselle neighborhoods to spray for mosquitoes. While there are no set schedules for mosquito spraying, Roselle residents can find out when spraying will be done in their neighborhoods. Residents who live in Bloomingdale Township (DuPage County) are served by Clarke Mosquito Control. 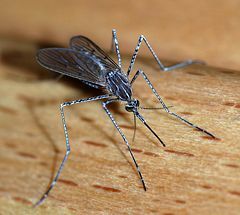 Residents can contact Clarke's "Mosquito Hotline" at 1-800-942-2555 to get put on the list to be notified when spraying will be occurring in their neighborhood. Those who live in Schaumburg Township (Cook County) are served by the Northwest Mosquito Abatement District, which can be reached at (847) 537-2306. Residents can contact them to be put on the list for notification when spraying will be occurring. For more information about preventing the spread of West Nile Virus, please visit the Centers of Disease Control West Nile Virus website. The DuPage County Health Department launched an online alert system to help educate the public about the potential risk of contracting West Nile virus (WNV). This alert system, known as the Personal Protection Index (PPI) is part of an aggressive public health education campaign targeted toward WNV prevention. The PPI alerts residents of WNV risk level and advise them of the precautions they should take to protect themselves and their loved ones. Based on the DuPage County Health Department's review of human and mosquito surveillance data, the PPI widget below will be updated by 3:00 p.m. each Wednesday throughout the WNV season. Additional WNV surveillance data is available on the DuPage County Health Department website.